BB TestAssistant – это инновационный инструмент, который облегчает процесс фиксирования сложных проблем и предоставляет подробную информацию о сбоях в работе приложений их разработчикам. Как это работает? Программа записывает экран ПК и создает видеоклипы замеченных проблем. Начните запись и пользуйтесь ПК обычным образом. При обнаружении проблемы BB TestAssistant моментально создает видео, а также записывает все действия, которые привели к ее возникновению. Для тестировщиков: подробное описание проблемы, не прикладывая никаких дополнительных усилий. Просто приложите видео к сообщению об инциденте. BB TestAssistant интегрируется с системами Jira и Bugzilla, что позволяет создавать записи об инцидентах и прикладывать к ним видеоклипы. • Windows 2000 и выше. Поддерживаются 32 и 64-битные версии Windows. • Процессор: минимум 500 МГц, рекомендуется 1 ГГц. • Память: минимум 256 Мб, рекомендуется 512 Мб. • Дисплей: 800x600 или более высокого разрешения. • Видеокарта: минимум 8 Мб видеопамяти, рекомендуется 64 Мб и выше. • Интеграция файлов журнала и журнала событий Windows. Файлы хранятся в видеозаписи и синхронно отображаются по мере проигрывания видео. BB TestAssistant is a new type of program that aids software testing. It records video, sound, keystrokes and mouse activity on the target PC, making it into a movie that's easy to view and distribute. Try it and improve tester-developer communications today. A BB TestAssistant movie contains more than screenshots or keystrokes. It records PC spec., mouse and keyboard inputs and logging information generated by the target application. Developers see exactly what happened - an accurate and permanent record of events. Annotate movies with text, images and commentary. Powerful editing and navigation lets you cut down recording to just show the issues. Export to Flash, AVI, WMV, EXE or PPT formats, with full control over movie size and quality. 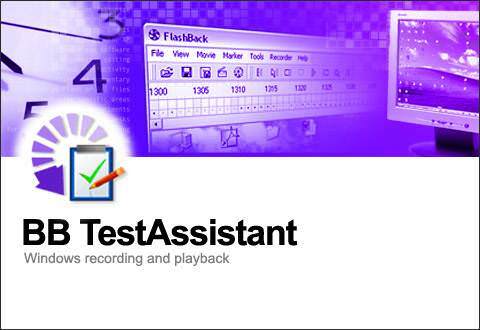 BB TestAssistant uses Blueberry's FlashBack capture technology - a radically different way of capturing the action than other screen recorder software. It has minimal impact on PC performance, so you can record continuously without impacting the performance of applications under test. Because it records only screen changes and uses a custom compression engine, FlashBack native format movies give you great quality at a tiny file size. *Exports to Macromedia Flash, AVI, EXE, WMV and Powerpoint formats. *Add images and sound files. *Record a commentary at record-time or later when editing. *Three recording modes to suit old and new PCs. *Flash and EXE exports include media player-type controls. *Full control over export file size and quality. *Create/edit HTML templates for Flash movies. *Capture all sound playing through system. *Selectable codecs for AVI and WMV formats. *Save individual frames as image files. *Record entire desktop, selected area or single window. *Clip movie to any selected area. *Export clipped movies with 'autoscroll' to keep mouse in frame. *Speed up or slow down playback to see events in detail. *Send movie by email in a single click. *Insert 'click to continue' pauses. *Record indefinitely and limit HD space used. *Frame preview 'thumbnails' for easy navigation. *Search movie for text string.